It is 8pm and I'm finally sitting down from a busy day, which included cleaning the house. I am enjoying sitting in a clean living room relaxing on the couch. On a side note, gnats have arrived again here in Southern AL and they decided to invade our house for some reason. I'm working on a way to kill those little suckers, so far it is working! I will be sharing all about it once my experiment is finished (read: all gnats residing in our house are DEAD). 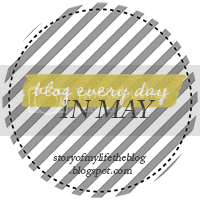 Now let me get to the actual point of this post, which is part of the May blogging challenge with Story of My Life. Today's blogging prompt is "educate us on something you know a lot about or are good at." I decided on what I wanted to educate ya'll on instantly, because it is something I LOVE. I have not shared many baking recipes on the blog, mainly because I have been trying to eat entirely gluten free. It is always so tempting to be around baked goods filled with gluten, so I have just avoided baking very much the last year. I know I can bake gluten free, but that requires expensive ingredients that just are not in the budget right now. You might have noticed my cinnamon swirl banana bread on Instagram earlier this week. The recipe will be coming next week, I promise! Baking is a subject I love and I'm excited to share with you 10 Basic Baking Tips! But first, I want to give you a little history on my love + talent of baking. My love of baking has always been a part of me, even before I realized it I think. Looking back on it I wonder why I did not pursue baking as a career path after high school. Probably because my parent's strong warnings to not get into the food service business. Side note: my dad has always been in the food service business so our family knows what it means--long hours, working on holidays, always on your feet, and more! I keep getting off track, back to my history of my love for baking. This is a picture of me when I was very little (maybe 3?) helping my grandpa mix up something. I'm sure I was telling him exactly what he needed to do. Well maybe not, I didn't talk much when I was little! But it is obvious I was having fun. This picture is actually framed and sits on my counter in my kitchen. Makes me smile every time I look at it. When I was in 2nd grade (or was it 3rd?) I had a friend over and we were allowed to take over the kitchen for a baking project with no supervision! What was my mom thinking? Anyway, we whipped up some peanut butter cookies. When we pulled the first cookie sheet out of the oven we could not wait to taste a PB cookie! Although, once we tried one we realized something went terribly wrong. Fortunately, we were smart enough to figure out our problem--1 cup of baking soda instead of 1 teaspoon. Ooops! Fortunately, that was the first and only MAJOR mistake that I have made in my baking adventures. Fast forward a few years later and I made the best orange danishes my mom had ever tasted (well at least that is what she tells me). She always says she could not believe I flipped through the cookbook, picked the orange danish recipe, made the dough and ended up with a great pastry. I think after that my mom stopped doubting my baking ability and I made up for my PB cookie disaster! I love to bake, it is relaxing to me to work with different types of doughs + batters. I enjoy seeing the end result of my hard work. I don't even really like to eat much of what I bake except for the first taste to make sure it is perfect. 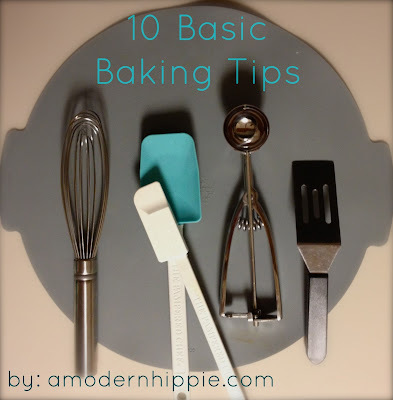 Now that I shared a little bit about my first baking experiences, I am happy to share with you some basic baking tips everyone, no matter what your baking skill level, can use. 1. MEASURE everything. Baking is completely different than cooking. When I cook, I rarely measure. But measuring ingredients when baking is a must! Baking is a science, which means things need to be accurate + precise. Measure liquids in measuring cups designed for liquids and measure dry ingredients in measuring cups/spoons intended for dry ingredients. 2. Use QUALITY products. I do not go cheap with ingredients I use for baking. The better the ingredients, the better the end result. For example, when buying vanilla (or almond) do not buy the imitation vanilla. Always use pure vanilla(or almond) extract. It might be more expensive, but the end result is SO worth it. I also almost always use organic ingredients (when the budget allows). The taste will not be any different using organic, but the fewer chemicals + pesticides we can avoid the better. 3. Do not use SALTED butter in baked goods. Instead, use unsalted butter and add the salt separately to the recipe. There is no way to know how much salt is in the butter, so it is difficult to know how much additional salt should be added to the mixture. I will admit, I do have one recipe that I love with salted butter + additional salt, but this is the exception not the rule. 4. There is a difference in how to measure DRY INGREDIENTS. Flour, sugar, oats, and other types of dry ingredients should be scooped into the measuring cup and leveled off with a knife. Brown sugar should be scooped into measuring cup and packed into cup until the brown sugar is level with the top of measuring cup. There are a few recipes I have run across that indicate NOT to pack the brown sugar, although most recipes indicate using packed brown sugar. 5. Follow the DIRECTIONS on the recipe, no breaking the rules in baking. There is an entire vocabulary devoted to baking--stir, mix, fold, cream, whip, and more! If you are unsure what the directions mean, do a quick google search or look in an older cookbook like Betty Crocker or Better Homes & Gardens. Many older cookbooks have a great section to learn about cooking + baking. 6. When a recipe calls for SOFTENED butter do not MELT the butter! Softened butter means it is about room temperature. This takes some planning ahead. Melting butter when the recipe calls for softened butter will totally change the outcome. Remember as I said in tip #1, baking is a science so things need to be precise. 7. 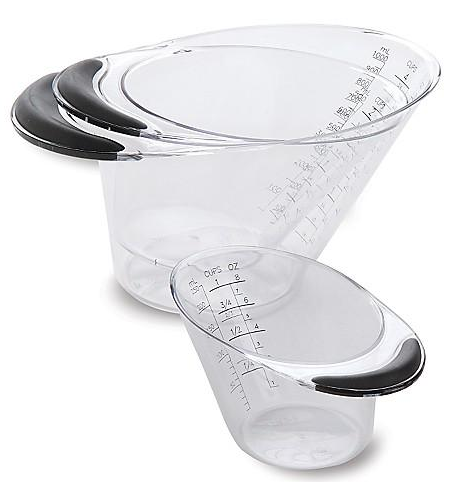 Use SAFE and quality baking dishes. Almost all of my baking dishes are glass, restaurant quality stainless steel, or stoneware. 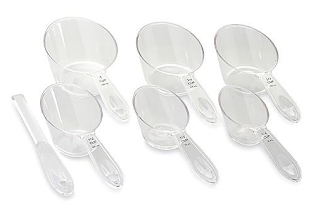 My favorite for cookies is stainless steel baking sheets; breads and cakes I love using glass. Check out this article for details on safe cookware & bake ware. 8. Make PARCHMENT paper your friend. I love using parchment paper for cookies on my stainless steel baking sheets because it helps things not stick to the pan and makes for easy clean up. 9. Do not OVERCROWD a pan with cookies. Give the cookies room to grow. A good distance is 1.5 to 2 inches apart. You will find that things bake much better when there is a little space between the food. 10. Oven TEMPERATURE + baking TIMES are not always reliable. There are many factors that could impact the end result of baked goods-- humidity, elevation, accuracy of oven temperature, and more. This is where you have to be FLEXIBLE when baking. I highly recommend an oven thermometer, as most oven temperature gauges are not correct. Play around with the baking times for recipes. If you like a chewy, softer cookie you may want to bake for less time, or a crispier cookie may need more time. The recipes I bake all the time I know exactly how long they need to bake in our oven for the consistency I'm trying to achieve. Well, until we move to another house! 11. Bonus! For fun, wear an APRON. This is not required, but it does help your clothes to stay clean and flour free! 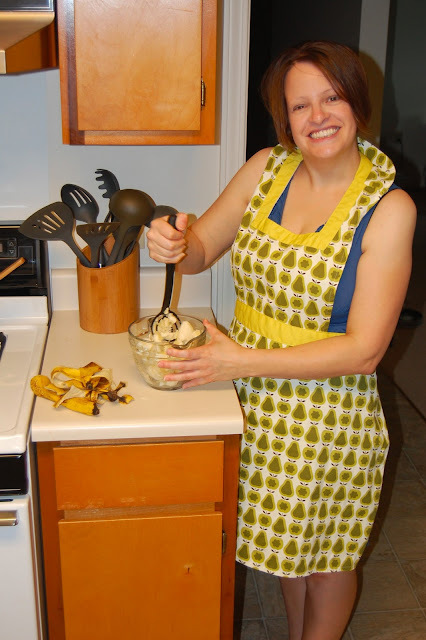 Do you wear aprons? Do you love to bake? What is your favorite baking recipe? Thank you, it is a picture I hold dear to my heart. Awww! 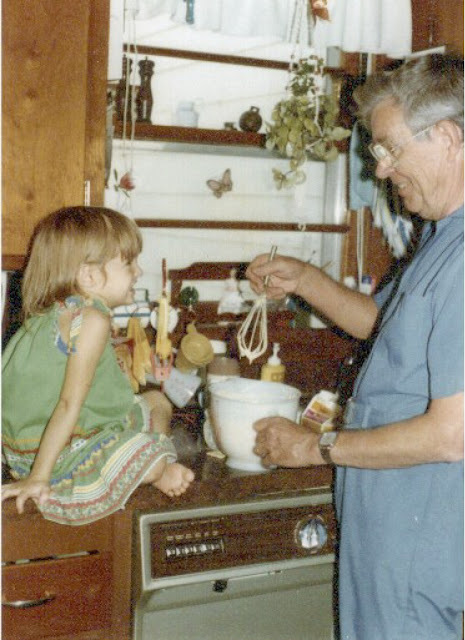 This is a favorite post of mine - just reading your telling of those baking adventures when you were young and the sweet picture of you and Grandpa baking....all special memories! The telling of the orange danish was exactly right - I was amazed that my young daughter could whip up near perfect orange danish all by herself, when I struggled with simple pie dough (and still can't make pie dough to this day!!) 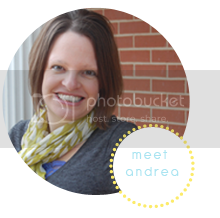 Great post Andrea. So glad you enjoyed it! I'm glad I got the orange danish story exactly right:) I guess I better teach you how to make good pie dough next month when I get home.